Friday 29 September is European Researcher’s night and for the third time Manchester Museum will be hosting Science Uncovered Manchester – a special late opening showcasing Manchester’s finest researchers and their work for an adult audience. There’ll be research on show, music, drinks and a lively atmosphere. Our participation in Science Uncovered event is funded by the Natural History Museum, who’ve hosted this event successfully for several years in London and Tring. European Researcher’s Night is a Europe wide initiative, in which thousands of researchers all across Europe meet the public and share their work in a social setting. We want 50+ researchers to join us at the Museum to share research with our curious audience. You can share research on whatever theme you are working on and we are especially keen for research that connects to our collection, as we would love to get objects out on the night. So if you’ve got something interesting to share, get in touch, information is below. During the day, there will be two sessions 11am – 12pm and 1pm – 2pm, where researchers can present to invited primary and secondary school groups. The Museum will then open later than usual, and Science Uncovered will be open to the public at 5pm. As the Museum has an established A-Level audience, we want to offer them a chance to participate in this one off event. 5-6pm students will be encouraged to visit research stations and may quiz you about how you found your way into research. A great engagement opportunity to inspire researchers of the future. 1) Research Stations – Host an interactive table top activity to get a conversation started. The focus of our research stations is to get chatting to the public – so leave the poster boards behind and bring your best conversation starters, objects, equipment and demonstrations. The smallest practical station would be two researchers at a time and researchers would need to work in rotation for the duration that a station is running. A limited number of large, flagship stations are possible on the night and these may have 10 or more researchers. 2) 3 minute talks in the Study – got something interesting to say in 3 minutes? The hop on our soapbox and give us an entertaining 3 minute insight into your work. Our study is the perfect space for research, learning, activities, temporary exhibitions, or just to take time out in the city. 3) Film Reel – If youwant to screen your new documentary, or showcase some behind the scenes footage of your process then apply to be part of our film reel. Films must be sent in advance and must be no longer than 20 minutes in length. Films will be played on loop throughout the day. 4) Story telling – has become a popular activity and with researchers spending time in the field, at sea or in other unusual circumstances has the potential to captivate otherwise “Science reluctant” audiences with compelling stories. 15 minute stories based around your experiences as a researcher. Short training exercises available to help you prepare. 5) I Love Research Q&A (daytime only) – This is a chance during the day to talk to school groups in the Museum. A great opportunity for school children of all ages to interact with active research, share your knowledge, experiences and advice. Sign up and prepare a 5 minute talk to engage pupils about why you love research. Prepare for a few probing questions. We are open to you trying your hand at any of our activities but bear in mind, if you are on a research station, you’ll need to find a colleague to keep the conversation flowing while you’re away. A fun night of conversations around your research. We will evaluate the event and include questions around the impact of research for you to use to evidence your public engagement activities. We are hoping to get a significant audience so you could reach lots of curious adults and students. Fill out our Science Uncovered Manchester application form (LINK) by 10 July 2017. The form isn’t too long and it helps us get a feel for what you might be interested in. We want the event to be as accessible as possible and for the audience to really engage with your work, so we might ask you more questions after you’ve submitted your application, or ask you to modify your idea – we hope you won’t mind collaborating with us. Last Sunday welcomed David Orchard to the Manchester Museum; David is a local amphibian expert who very kindly came in to host our Urban Naturalist workshop all about native amphibians. David proved to be a big draw as despite the beautiful weather outside on Sunday we had a great turnout of Urban Naturalists eager to learn more about our native frogs, toads and newts. We were all well rewarded for our attendance, as David gave a comprehensive introduction into species identification, life cycles and habitat requirements. We were also treated to an expansive introduction to amphibian surveying, the do’s and do nots, from egg identification to tips to avoiding disaster in a pond at night. We all emerged as apprentice ecologists eager to embark on our very own back garden surveying! Special mention has to go to a small pair of palmate newts; little did we know that the end of the workshop would usher in two live local amphibians. They most certainly stole the show. Whist they also presented an opportunity for everyone to practice their new found herpetological expertise! I would like to on behalf of myself, and all those present, whole heartedly thank David for his thoroughly entertaining and informative workshop. Last month’s Urban Naturalist was hosted by Dr Luke Blazejewski, a local wildlife photographer and conservationist. 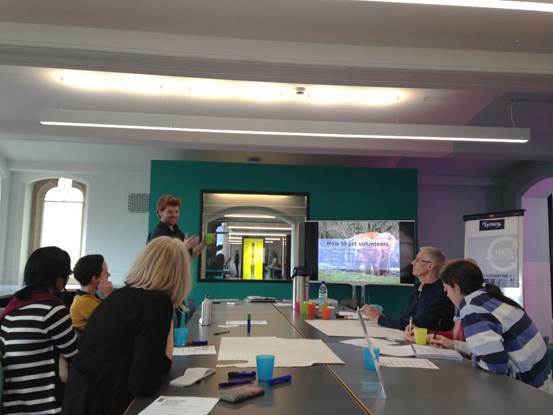 He led a fantastic workshop that looked at ways to engage communities with the nature on their doorstep. We were treated to some of Luke’s brilliant short films, including one looking at stories of the River Irwell as well as another that focused on the recent flooding in Salford. I really recommend watching them, please see the link below. His unique perspective on urban environment and its value to nature was refreshing, especially in this current climate. Luke’s enthusiasm was highly contagious and before the end of the workshop we were all drafting up a raft of ideas for local projects. Having established ‘Clean Up Salford’ in 2013 Luke has plenty of experience with developing local initiatives. This knowledge was supplemented by everyone’s personal experiences, which really helped to bring some novel and exciting ideas together. I would like to on behalf of myself and all those who attended thank Luke for his insightful and thoroughly enjoyable workshop. Sunday the 29th of May welcomes David Orchard to the Manchester Museum. David’s workshop will focus on native amphibian – identification, life cycles, habitat requirements and surveying. If you are interested in amphibians (like me) then this is the session for you. We hear about climate change on the news and in the newspapers. Climate change is happening all around us, but this isn’t the time to ignore it, it’s the time to get really, really, creative. Manchester Museum will be staging a series of exhibitions and events for visitors to explore what kind of future they hope for, and what it would take to help make that a reality. Look out for amazing Polar Bears and other Arctic wildlife, Peppered Moths, tropical frogs, opportunities to make a model of a future Manchester, and much, much more besides. The programme is being developed in partnership with the Tyndall Centre and Global Development Institute at the University of Manchester, and Manchester A Certain Future, the city’s climate change agency. The Climate Control exhibition opens on 11 May, with the first Climate Control event linking in with Manchester Museum at Night. Polar Bears, Peppered Moths and tropical frogs are all present in this new exhibition exploring climate change. Visitors are challenged to ask what kind of future they hope for, and what it would take to help make it a reality. Manchester After Hours A one night only, city wide social. A mix of odd couplings and unexpected partnerships. A chance for you to get into places and spaces not normally open after hours. It’s Museums at Night, It’s Manchester After Hours. Sound and image come together in these artist-led drawing sessions within the stunning setting of the Living Worlds gallery. Join in and see your work projected in the space alongside atmospheric, immersive performances scored by sound artist JC. Performances 8 and 9.3pm. 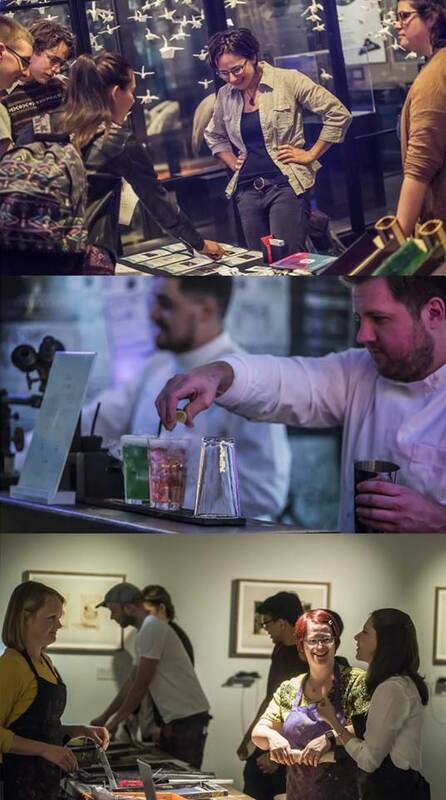 @seesawprojects Manchester After Hours A one night only, city wide social. A mix of odd couplings and unexpected partnerships. A chance for you to get into places and spaces not normally open after hours. It’s Museums at Night, It’s Manchester After Hours. Drop by to Make section in The Study for a crafty morning with climate inspired crafts. Bring your own make or have a go at our climate crafts. Drop in, free, adults. A day bursting with hands-on craft and art activities for all the family. Find out what life is like in the Rainforest. Discover the incredible diversity of life as you see some of the insects and animals from the Museum’s collection. You can also find out more about some of the Museum’s live animals. Meet experts and discover more about the Vivarium’s conservation work. Friendly, practical workshops run by leading naturalists. From wild food-foraging and composting to bird song and insect identification, explore biodiversity on our doorstep. Identification of our native amphibians and an introduction to surveying. Most people think they can identify a common frog…but would you be sure it’s not a common toad? Do you know the difference between a smooth newt and palmate newt and would you confidently be able to identify a great crested newt? This workshop will explain how to identify the five amphibian species which are common in the North West. It will also include a brief overview of the lifecycle of each species, their habitat requirements and how to survey for them. If you know where to look for amphibians they are fairly easy to see, so if you’d like to find these spectacular animals for yourself this event is for you. The workshop will be led by David Orchard who has worked with the conservation of amphibians locally for over 20 years. The Urban Naturalist is part of Museum Meets, The Manchester Museum’s year round programme for adults. Be inspired by the story of Manchester’s peppered moth in the Museum’s newly opened Climate Control exhibition, and explore the idea that we can’t change the past but we can change the future. Join us to create a growing art installation of peppered moths. Climate has been represented in many different ways in films – join Manchester Museum and the Centre for History Science, Technology and Medicine for a festival of climate control films ranging from the Grapes of Wrath, the Day After Tomorrow, to Frozen and the Island President. Genetics expert Laurence Cook and Head of Collections Henry McGhie will talk about the evolution of the Peppered Moth and its strong links to Manchester’s history and development. Part of the Museum’s Climate Control Season. Our Neanderthals talk, Exploring Representations of Neanderthals in Popular Culture, has had to move to a new date – it will now be on Sunday 12 June. Do hope you can come. Early popular culture representations played a significant role in shaping the stereotypical perception of Neanderthals as dim witted and brutish cavemen. This talk by Dr David Kirby, the University of Manchester and author of Lab Coats in Hollywood, will explore how this stereotype remains a prevalent feature in movie, literature, television and comic books but it will also examine how these representations have dramatically changed over the last 150 years alongside our scientific understanding of this species. Discover more about Neanderthals, who they were and how they lived, and how research at the University of Manchester is adding to what we know. See objects from the Manchester museum collection and talk to some of the experts who have contributed to the Rediscovering Neanderthals exhibition. Get hands-on and investigate what a Neanderthal’s skull looks like and compare it to other ancient skull models. Join us for a variety of activities for all the family. Last month’s Urban Naturalist event was hosted by David Winnard, an incredibly knowledgeable local naturalist and expert forager. We were treated to a comprehensive introduction to the poisonous and edible plants and fungi of Greater Manchester. David began the event with some samples of the sumptuous drinks he produces from foraged ingredients which immediately perked our interests! Not normally known for my adventurous palate I sampled lavender drink which was sublime, with all the other varieties also well received. Our taste buds tantalised, we were taken on an exploration of the dos and do nots of foraging, guided all the way by David’s expert knowledge and lovely photography. Combined with the examples of goods he had collected that very morning it helped create an immersive experience that was thoroughly enjoyable. The assembled participants were invited to share stories of different experiences of foraging and identification with near misses and success stories a plenty. I particularly enjoyed the ‘Edible or Deadible’ section of the workshop where we were invited to guess, based on images whether or not a mushroom was toxic. It certainly highlighted my lack of judgment; perhaps more research will be required before I start sampling the local mushrooms. I would like to on behalf of myself, and all the participants, whole heartedly thank David and Lauren for putting together such an engaging and informative workshop from which we all learnt so much. This Sunday’s event is the turn of Dr Luke Blazejewski a wildlife filmmaker and conservationist working out of Salford, whose workshop will focus on the relationship between people and nature in cities, and explore ideas around community engagement. He will also be sharing some of his experiences as an urban naturalist, encouraging people to develop new ways of helping communities engage with the wildlife on their doorstep.